Today I have a closer look at the new IT Cosmetics Confidence in a Compact with SPF 50+. It is the first-ever, clinically shown anti-aging solid serum. 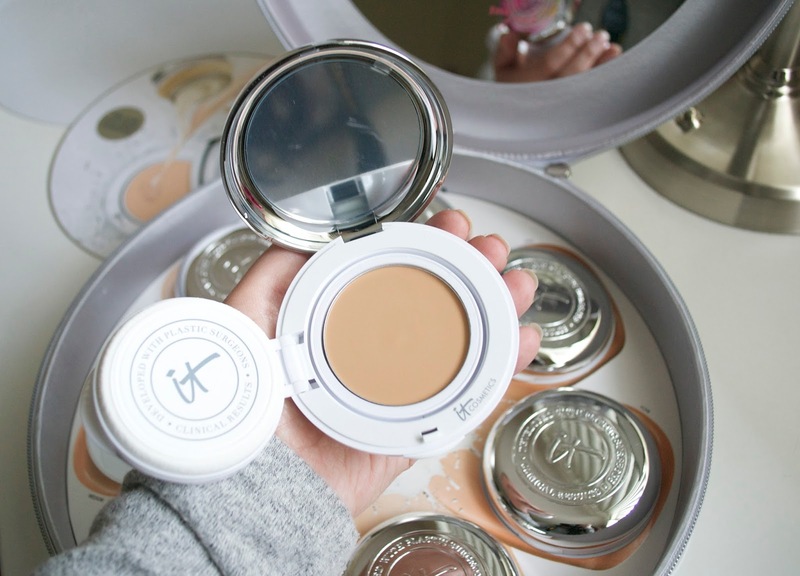 Even though the product comes in a compact, your still getting full coverage look while getting skincare like benefits for your skin. There are 7 different shades to choose from which helps to find the best match for you. Find out more and see swatches of all shades below! The Confidence in a Compact will deliver IT Cosmetics best selling Confidence in a Cream and SPF 50+ UVA/UVB broad-spectrum physical sunscreen. This product is going to be everything you need in one simple step. You can use the Heavenly Skin Skin-Smoothing Complexion Brush to apply or the included sponge. I got the best and even coverage by swirling the brush into the compact and then applying. From someone that has dry/sensitive skin, I can definitely say that I absolutely love this product! I use the shade Light and it is the best match for me. It applies smooth and is easy to blend out. One layer of it is enough for me for full coverage but you can build it up in certain areas where you might need more with no trouble. Once applied to the skin, it feels lightweight and gives the skin a natural look. Sometimes if I wear other full coverage foundations or face products, you will see my dry spots and it doesn't look smooth. With the Confidence in a Compact, my skin feels moisturized and it stays put throughout the day. It does not accentuate my dry spots and it just makes my skin look nice and even. The IT Cosmetics Confidence in a Compact retails for $38 and can be found at Ulta and on the Ulta website.